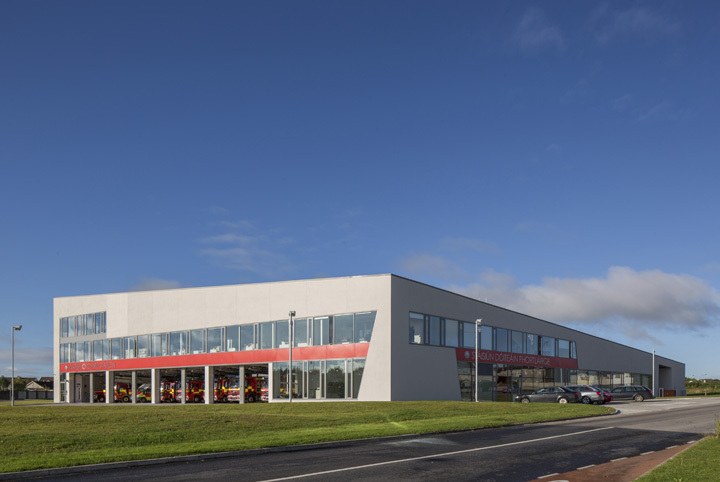 Waterford Fire Station is the emergency response centre for fire fighting, river rescue, car crashes, training and public consultation in the region. In an inhospitable environment on the ring road around the city, it creates its own artificial landscape, a new geography of enclosure. 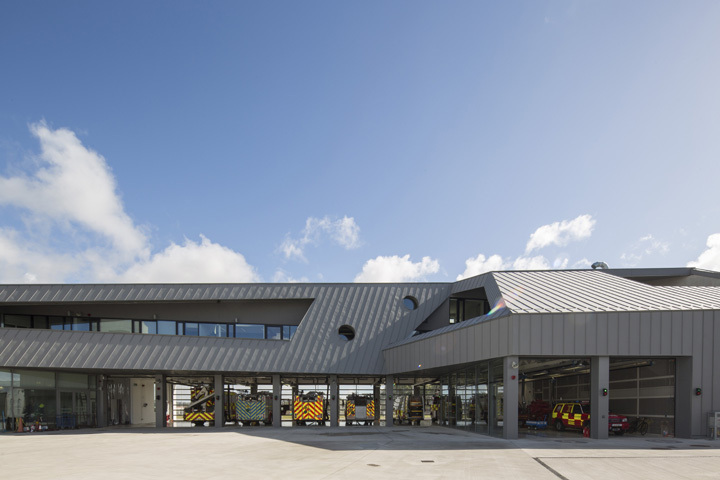 Shaped around the active service it delivers where function is paramount, the building form is derived from the tracking movements of the fire tenders leaving their appliance bays at speed and returning after fire fighting duties. A strong but simple enclosing form wrapped in zinc is folded around – origami-like – to enclose a large drill yard, itself differentiated into different training zones. 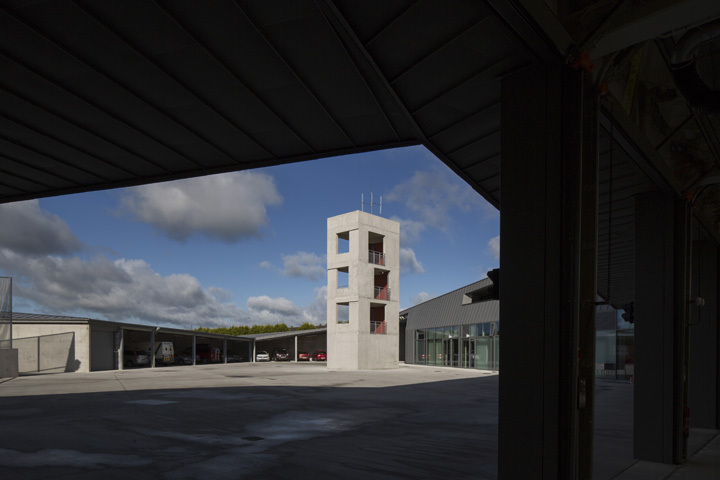 Organised in a sort of spiral, rising from single storey vehicle parking, workshops and dormitories to a first floor of offices, canteen, leisure and study facilities and terminating at a third storey lecture theatre, the zinc roof is angled and cut away to provide a series of sheltered inside-outside spaces overlooking the yard, where the drill tower acts like an urban beacon in a new public space. Appliance bay building with zinc roof. Waterford Fire Station, Waterford, Ireland. Architect: McCullough Mulvin Architects, 2015. Internal staircase. Waterford Fire Station, Waterford, Ireland. Architect: McCullough Mulvin Architects, 2015. Dusk view towards appliance bay with vehicles. Waterford Fire Station, Waterford, Ireland. Architect: McCullough Mulvin Architects, 2015. Drill tower in drill yard. Waterford Fire Station, Waterford, Ireland. Architect: McCullough Mulvin Architects, 2015. Corner elevation from ring road. Waterford Fire Station, Waterford, Ireland. Architect: McCullough Mulvin Architects, 2015. View from zinc roof towards drill tower. Waterford Fire Station, Waterford, Ireland. Architect: McCullough Mulvin Architects, 2015. Appliance bay with vehicles at dusk. Waterford Fire Station, Waterford, Ireland. Architect: McCullough Mulvin Architects, 2015.